The fact that the Basque coast was a pioneer territory in summer tourism, with a significant influx of foreigners, is one of the reasons why the first golf courses settled in it. Chronologically, the Real Golf Club of San Sebastian is the dean of the clubs of the Iberian Peninsula, since it was founded in 1910. In 1925 it adopted its current name and 40 years later, it moved its facilities from its initial location in the vicinity of Lasarte- Oria to the slopes of Mount Jaizkibel, in the city of Hondarribia-Fuenterrabía. An entertaining 18-hole golf course in Euskadi, located on a 50-hectare site that saw the great champion José María Olazabal, who at the age of 18 won the British Amateur Championship and at the Augusta Masters (twice), being captain of the European team of the Ryder Cup and winner of the Prince of Asturias Award for Sports in 2013. In the town of Getxo, the Real Golf Society of Neguri is chronologically the second oldest club in Spain, because it was inaugurated in 1911. Like the previous one, it was moved to new lands in the sixties of last century to face the needs of its growing social mass. 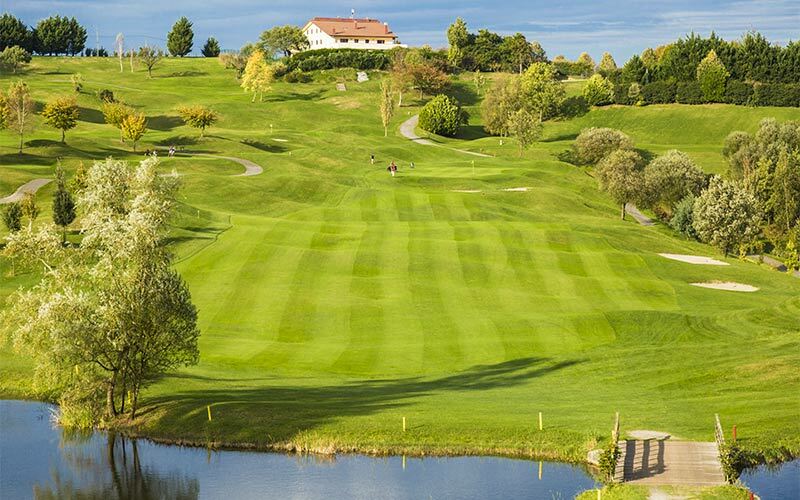 Known as ‘La galea’ – because it is located on the field that is next to those cliffs on the eastern edge of the Abra de Bilbao – it is considered the best course in Spain. Between both courses, bording with the famous Zarautz beach, there is the third oldest golf club of Spain: the Real Golf Club de Zarautz (inaugurated in 1916). It has a peculiarity: its 9-hole course is the oldest active route in Spain, since it has not moved its location and its streets and its greens have not been practically modified. In the last decades, golf in Euskadi has had a very important development, in terms of players and facilities. In the vicinity of San Sebastián, a 18-hole course called Basozabal was inaugurated, while in its surroundings –in Andoain– another 9-hole course called Guiburu was built. In Bizkaia, next to the previously mentioned Golf of Neguri, there are six other interesting courses that are situated in the metropolitan area of Bilbao, being possible to practice golf during the whole week in different courses each day with minimum trips. The geographical distribution of the golf courses from Álava is a little bit opposite to the ones from Bizcaia, because those are distributed according to territory, being the smallest course –a 9-hole course, Jundiz – in the Llanada Alavesa that surrounds Vitoria-Gasteiz, while another one – the Altube course – is next to the highway that connects this capital with Bilbao. Both, 18-holes courses of Álava-Araba are located in two beautiful natural environments: the Izki Golf Club is situated in the surroundings of the Izki Natural Park, in the well-known “Montaña Alavesa”, very close to the route of the Camino Ignaciano. 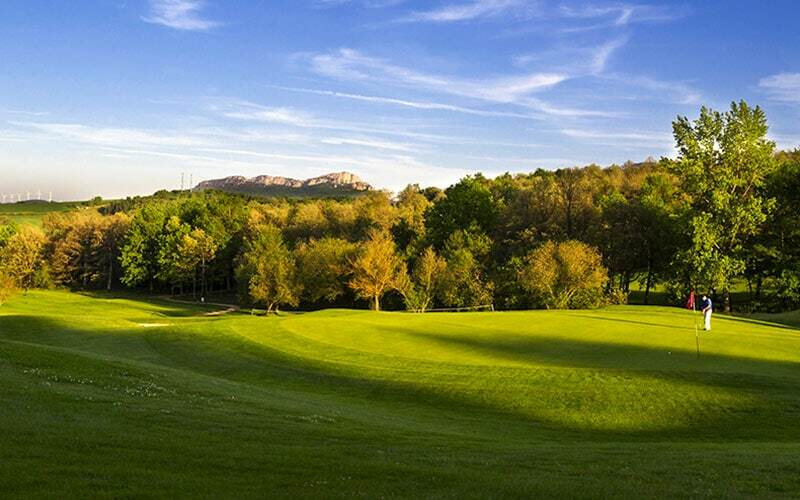 Closer to Vitoria-Gasteiz and very close to the Ullibarri-Gamboa and Urrúnaga reservoirs, it is situated the golf course of Larrabea, with an excellent club house and 18-holes. The tradition of golf in Euskadi, together with the knowledge of languages and the current tendency to travel has led a significant number of young Basque golfers to attend universities in North America, financing their studies with sports scholarships. Among these, Jon Rahm stands out. Trained at Arizona State University, he has been winning prestigious tournaments since he was 16 years old. Currently, Rahm is one of the best players in the world.